This book was just fine writing from beginning to end...perfect historical fiction, well researched, the vernacular was just right, and the love story was beyond moving. It's 1810 and Tristan Northwood is going through life as the stereotypical spoiled young English aristocrat having fun, womanizing, drinking too much and indulging as much as he can. In an effort to sober him up (in more ways then one) his father marries him off to Charlotte Mountjoy, a young woman from a good family with financial troubles. Charlotte has no interest in love or marriage so is agreeable but uninterested. Tristan and Charlotte have a friendship, bu there is no love, they produce and heir for Tristan's father. And Tristan begins to fall in to a deep depression. In comes Captain Charles Mountjoy, Charlotte's twin and the man that will change Tristan's life. They share and interest to learn about medicine and become partners in in that too. These two men were perfection, their love and passion for each other, the will to sacrifice, the need for each other so great it was palpable. They were like beautiful music, just good and right, and lovely to experience. This book had all the makings of a great novel I kept getting surprised and thinking..."I can't believe this was written this year" This writer is well acquainted with another time. 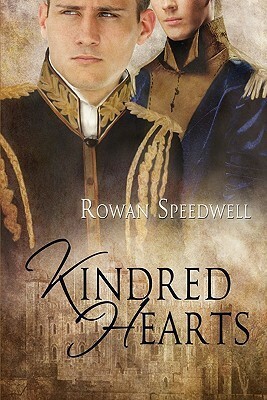 Sign into Goodreads to see if any of your friends have read Kindred Hearts. 50.0% "Tristan and Charlie...*sighs* Devastating and perfect in every way...I wish this book had a 1000 more pages..."
70.0% "Yep they're still breaking my heart and making me love it..."